Maggio began her new economy work as a BerkShares Intern in May of 2012 and grew into her subsequent role as the Director of Programs at the Schumacher Center and Executive Director of BerkShares, Inc. In the media, Maggio has been interviewed by Paul Solmon for a story on the PBS NewsHour, as well as stories by Al Jazeera America and Truthatlas.com. In 2014 she was interviewed by Henry Rollins for an episode of his History Channel show called “Ten Things You Don’t Know About Money.” She represented BerkShares and the Schumacher Center at the 2nd and 4th International Conferences on Complementary Currency Systems in the Hague and Barcelona, respectively, the Left Forum in New York City, and the Local Prosperity Canada conference in Nova Scotia, among others. Maggio grew up in Berkshire County, Massachusetts, and graduated from Mount Everett Regional High School in Sheffield. In 2010 she completed her B.A. in Sociology and French Studies at Wesleyan University. After college she went on to bake pies in Brooklyn, teach English in the Alps, and cook Basque food in Manhattan before coming home to work at the Schumacher Center for a New Economics. She serves on the Board of Trustees for the Berkshire Children’s Chorus and on the Community Advisory Board for WAMC Northeast Public Radio. She has also served on the Board of Directors for the Berkshire United Way and the Board of Directors for the 1Berkshire Strategic Alliance. In 2017 she became a corporator for Lee Bank, a community bank in the Berkshires. 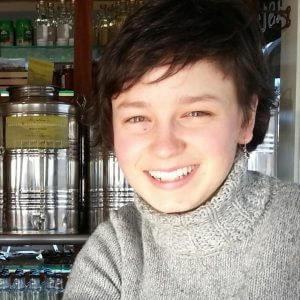 Alice Maggio is currently pursuing a graduate degree in Urban and Environmental Policy and Planning from Tufts University in Boston, where she has co-authored Soil in City: Urban Farming on Community Land Trusts. Contact Alice Maggio about speaking terms and dates.